When a murder investigation gets tough, the police let school kids solve it for them. 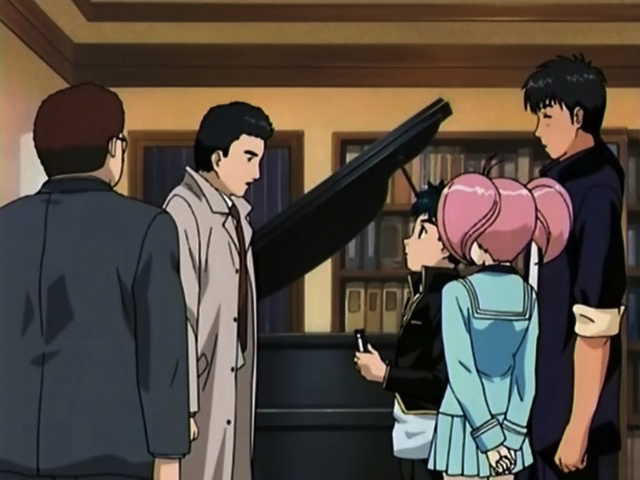 Detective Academy Q (Tantei Gakuen Q) is a 45 episode mystery series that ran in 2003-2004. It is based on a manga by the same author as the Case-files of Young Kindaichi, which I briefly reviewed here. The same author, Tadashi Agi, also wrote the story for Knight in the Area, whose anime adaptation is set to broadcast Winter 2012. Unlike Kindaichi, which has strong Horror and Supernatural elements (but is also legitimately in the Mystery genre), Detective Academy Q is straight Mystery. I’ll discuss the genre issue in depth below. My summary judgement is that it was a fairly enjoyable watch. It certainly isn’t as polished as I would have liked, in terms of Art and Music, and it had some goofy aspects to setting and characters, but the plot was typically satisfying. Again, I go into my reasoning after the jump. This is, however, a spoiler-free review, so feel free to read on, before deciding for sure whether this is a show you want to watch or not.